NASA has cancelled the planned mission to service the Hubble Space Telescope. On Friday, NASA Administrator, Sean O'Keefe, told Hubble managers that there would be no more shuttle visits to maintain it. The result of the mission cancellation will be that Hubble will cease functioning and will "deorbit" much sooner than expected. A shuttle mission to "service " the space telescope had been planned for next year. Astronauts were to replace the gyroscopes and batteries. Two of the telescope's six gyroscopes have failed. Hubble requires three functioning gyroscopes to perform properly. 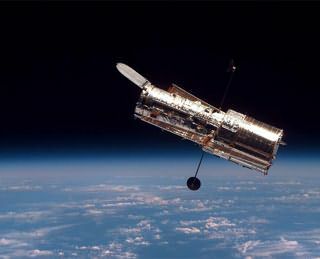 Two new instruments, the Wide Field Camera 3 and the Cosmic Origins Spectrograph, were also to have been installed on Hubble during the cancelled mission. These two instruments have already been built at a cost of $200 million. It had been hoped that with the new gyroscopes Hubble could continue to function until its successor, the Webb Space Telescope, becomes operational. Safety concerns are said to be the reason for the cancellation of the servicing mission. New safety requirements, resulting from the destruction of the shuttle Columbia, make it impractical to send a shuttle anywhere but to the space station. Such a mission, like that to service the Hubble, would require having a second shuttle ready to launch in case a rescue were necessary. According to this New York Times article, NASA gets a double whammy from the cancellation. Not only does NASA loose the Hubble, it also has to develop a rocket that will attach itself to the telescope and brake Hubble out of orbit. the estimated at $300 million cost of developing such a rocket, will come out of the NASA astronomy budget. The Hubble Space Telescope has taken some remarkably beautiful images that impress astronomers as well as the public. Some of the images can be accessed here. More images are available here. NASA's "relatively short notice" is probably too long to save the Hubble. The only real chance to save the Hubble is a shuttle mission. If the Hubble servicing mission now requires a second shuttle being ready to launch the mission should still be flown. I agree that I am troubled by the apparent abandonment of Hubble. I don't know the extent to which the explanation given by NASA of the safety of the shuttle and reducing the risk to astronauts can be accepted at face value. Seems suspicious to me. This is just another in a long list of reasons why we need to develop vehicles (effectively a space tug and similar vehicles) that would operate only in space to maintain satellites like Hubble and assist in space construction like ISS, any eventual stations that will be placed at the L1 through L5 and, of course, vehicles that will travel to the Moon and Mars. It seems to me a crude vehicle could be developed on relatively short notice, and shot into orbit (perhaps in pieces) on expendable vehicles and assembled. ISS could serve as a base of operations and from there it could reach the Hubble and perform some or all of the necessary repairs and upgrades. This wouldn't be a throw away vehicle -- we would refuel it after missions and use it again. We need to take the need to develop a "space faring" capability seriously and this seems like a worthy place to start. What a waste is right. NASA is sounding like the General Motors of the 1980s, once you work the bugs out of an item you abandon it, like the Pontiac Fiero, Caddilac Allante, Buick Reatta and many more.